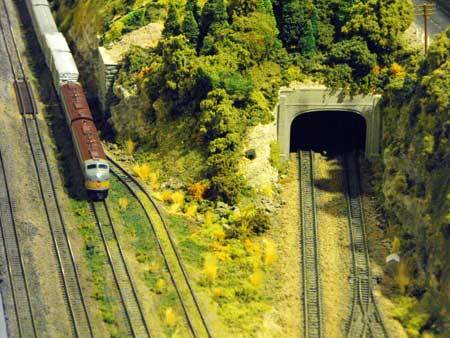 Below are model railroad pictures taken at the Brampton, Ontario train show in October, 2008. 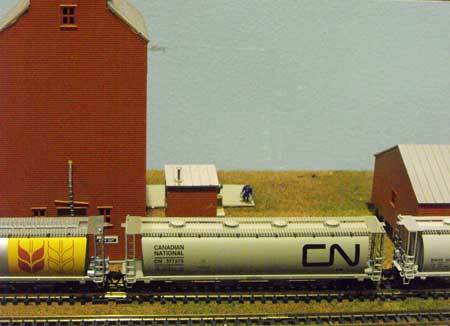 Brampton is a suburb of Toronto northwest of the airport. 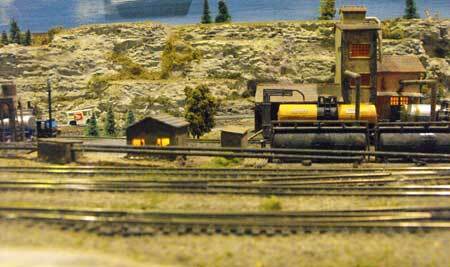 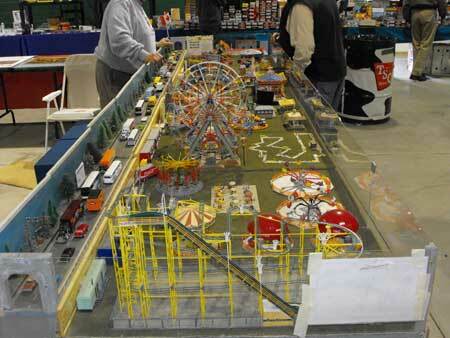 This popular annual show draws modular model railroads from the central Ontario region including our club layout, the Nottawasaga Model Railroad. 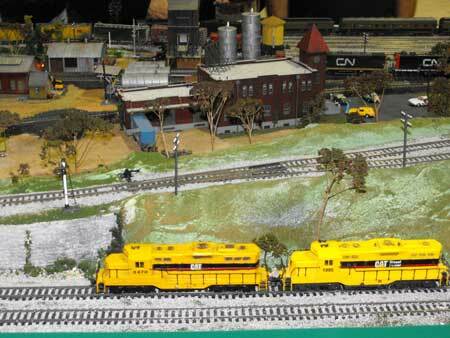 It's always difficult to take first-rate model railroad pictures at a train show due to the crowds, erratic lighting and motion of the trains. 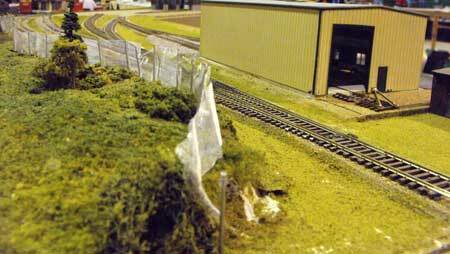 However, I've found I can get reasonable results if I use natural light, bracket the shots, and do some touchup of color and contrast in Photoshop. 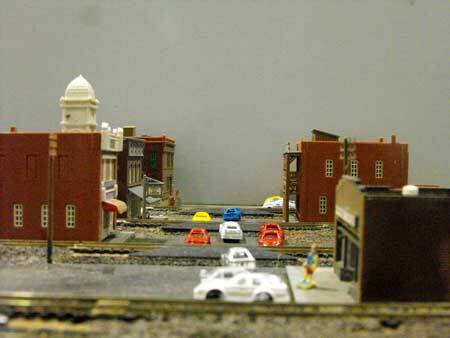 For those who care about such things I was using a Fujifilm Finepix S1000 10 megapixel camera with a 12X zoom. 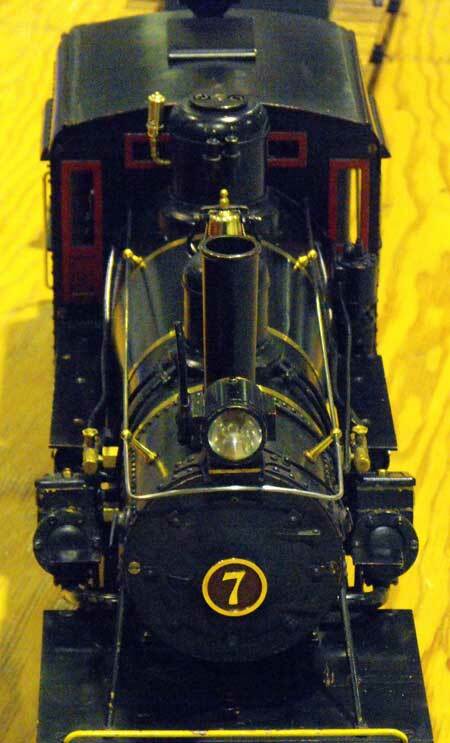 Because many photos were taken at around f2.8 and a shutter speed of 1/50 sec, any train motion would be blurry and it is hard to keep the camera steady for macro shots without a tripod. 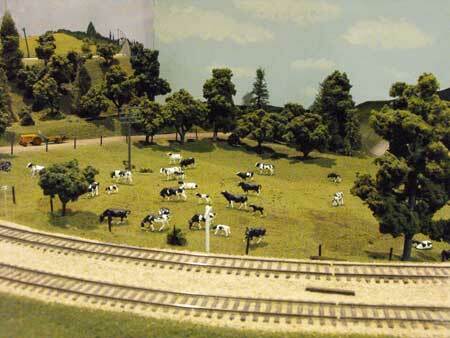 This is not to make excuses, but only to explain what I was dealing with during the show. 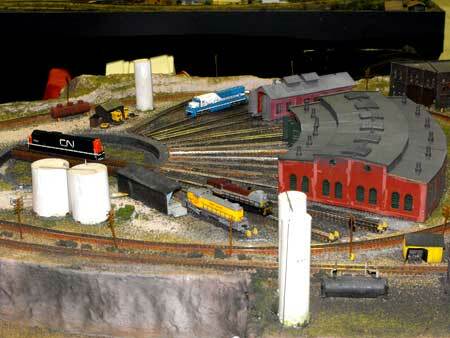 There are many good ideas here and some excellent modelling. 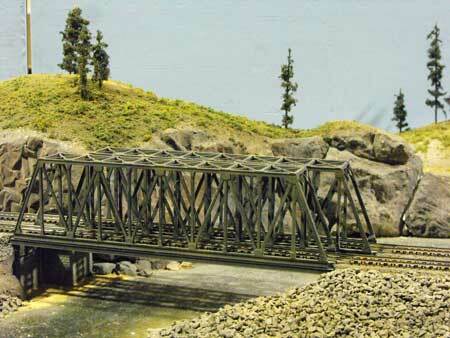 I'm posting these pictures to help you (and me) improve our own model railroads and raise the level of our work. 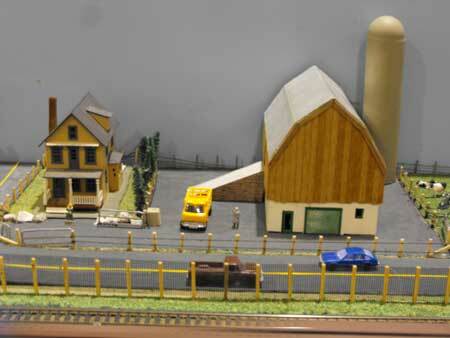 Click on the thumbnails for a larger view. 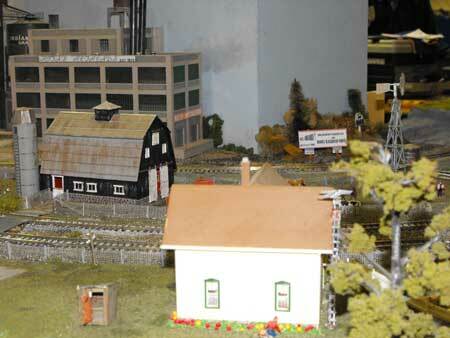 More model railroad pictures, both model and prototype, can be accessed from my Train Photos Gallery page. 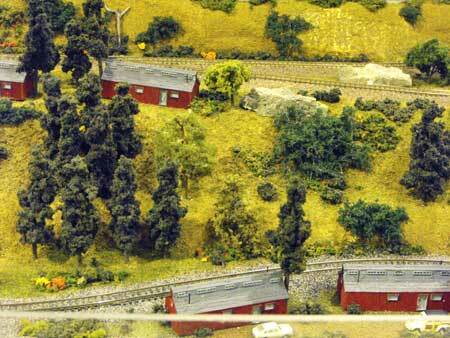 This group had split off from the Orangeville club. 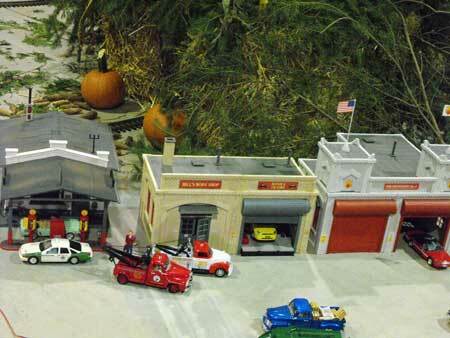 Their HO-scale railroad is transported set up on a trailer bed. 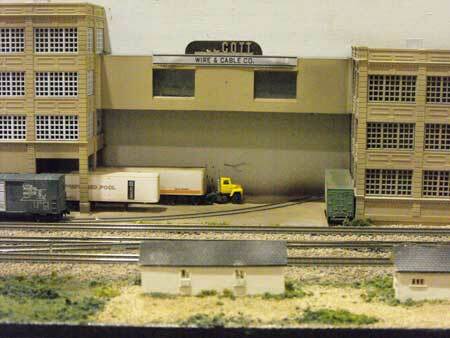 When not at shows it is stored at the Hockley Valley RR train store in Alliston where they can work on it. 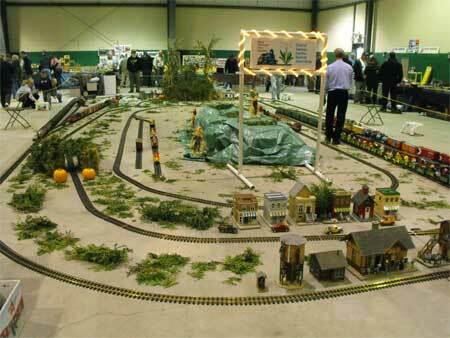 Hockley Valley is also home to a very large G scale indoor layout. 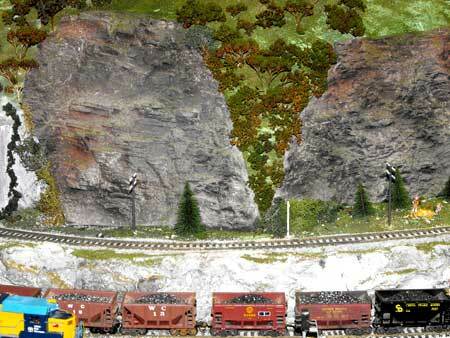 You can see a video I took of it on my G scale trains page about the HVRR. 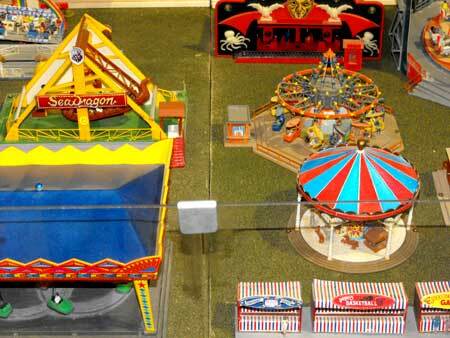 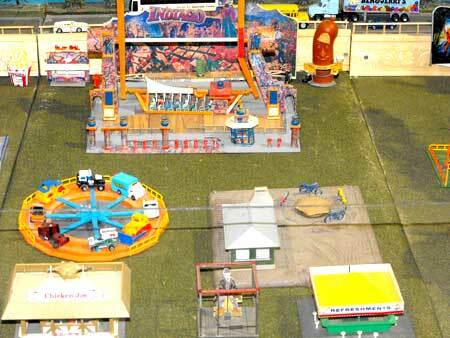 This circus diorama is totally animated. 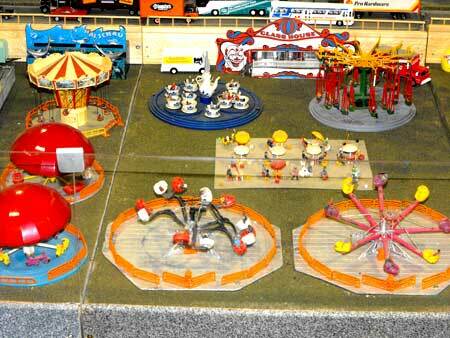 It is a real joy to watch all the rides whirring and swirling. 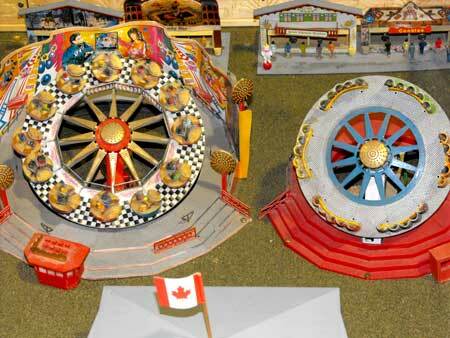 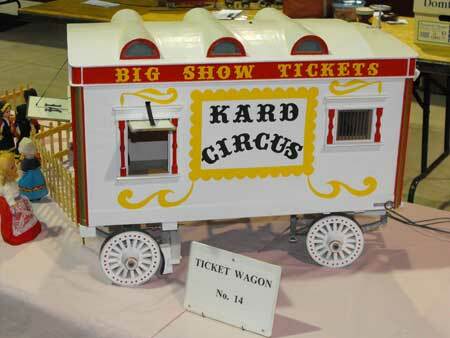 There are also some pictures of the 1 1/2" scale KARD circus wagons. 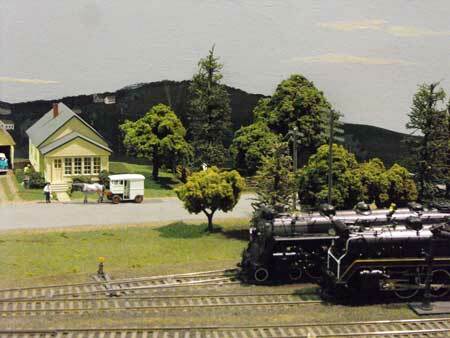 This club is a neighbor of ours in Midland on Georgian Bay, about an hour north of Wasaga Beach where we keep the Nottawasaga Club modular layout. 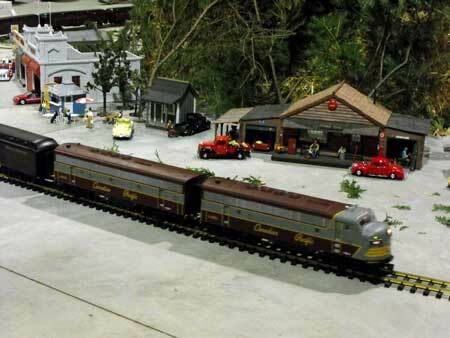 They have both an N-scale and HO-scale layout. 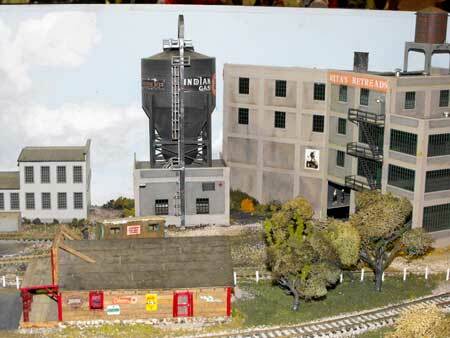 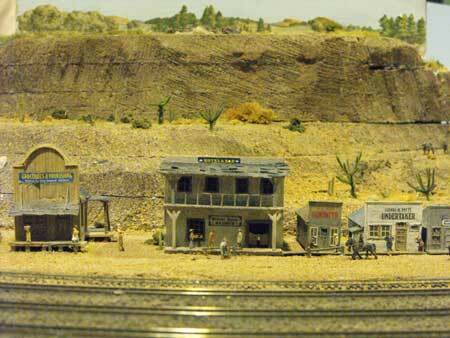 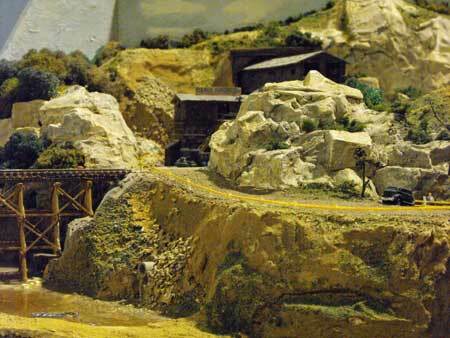 These model railroad pictures are of the modular N-scale layout. 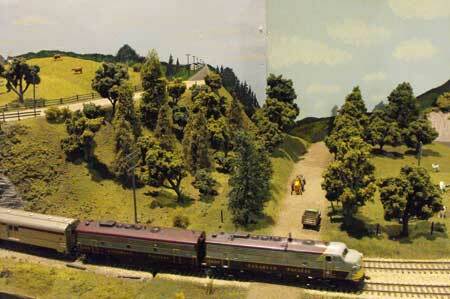 This club is located in a suburb in the west end of Toronto, Ontario, Canada. 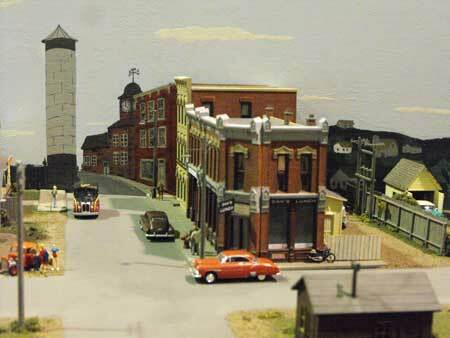 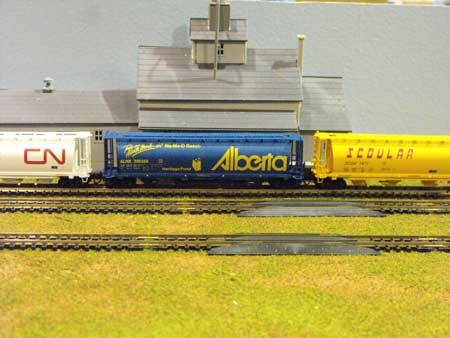 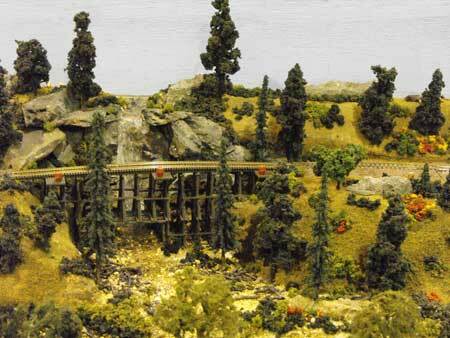 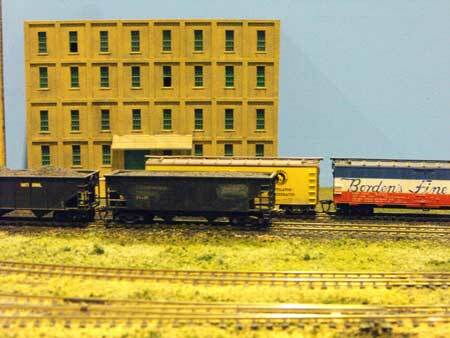 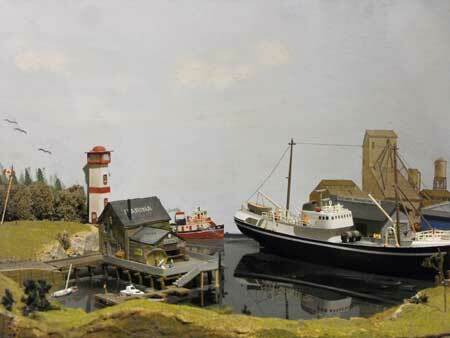 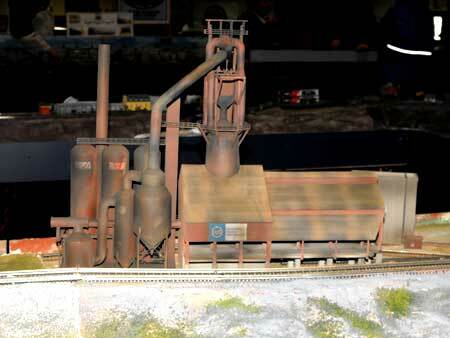 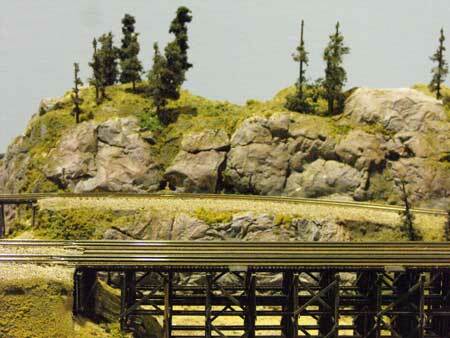 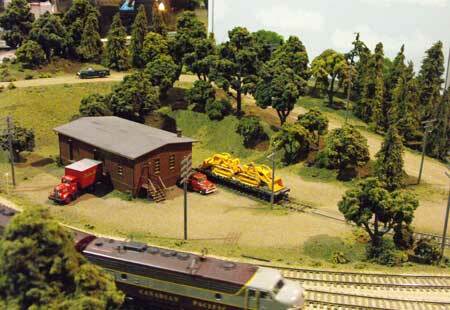 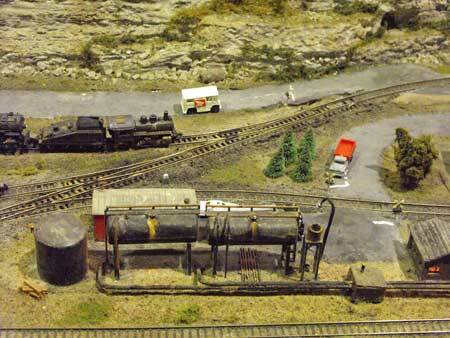 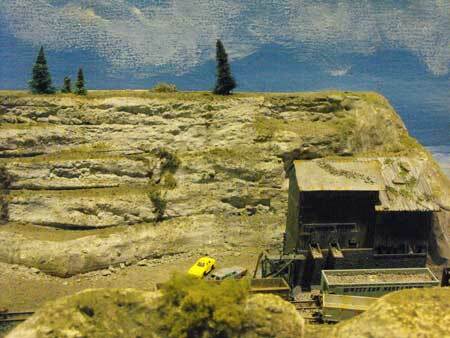 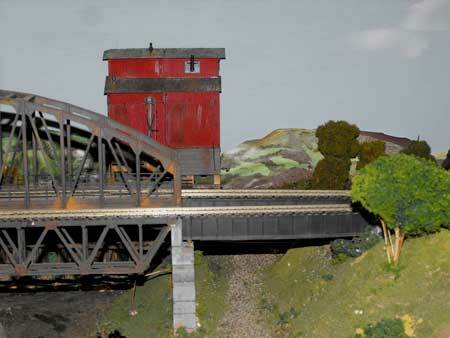 This is a mature N-scale modular layout well-known to modelers in central Canada. 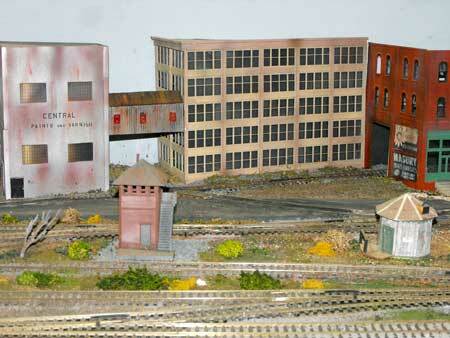 It operates well on DCC. 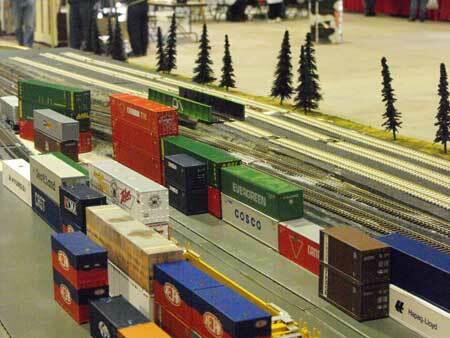 Members can run long trains at the shows. 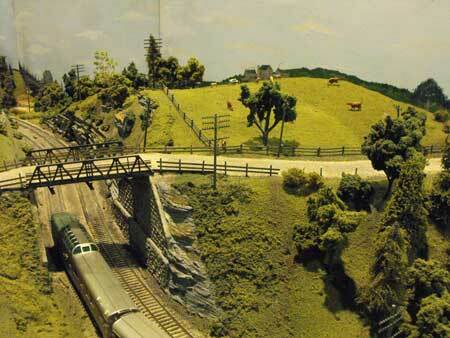 The scenery is well-done. 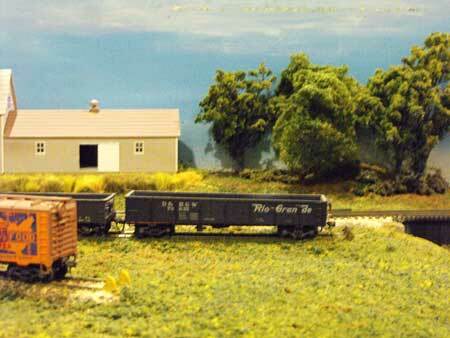 Free-mo (freemo) modular layouts are slowly expanding in our region. 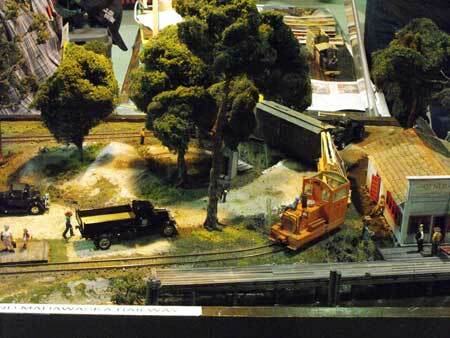 There were also a few modules at the Holland Centre train show. 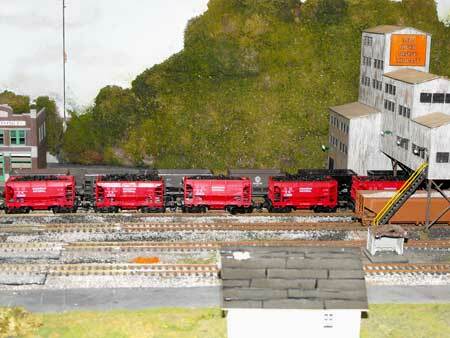 Some work-in-progress hand laid Fast Track switches can be viewed on my Freemo page. 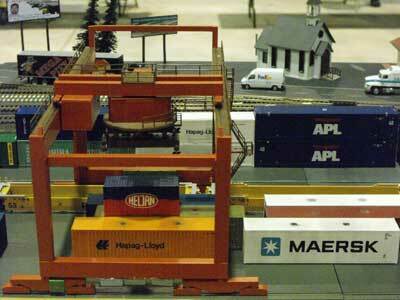 The operating container crane (below) was quite a sight! 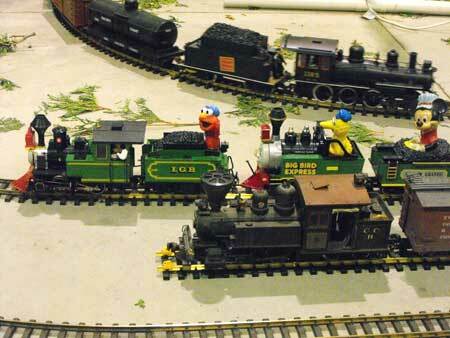 The freemo setups at recent regional train shows and at Trainfest have becomes bigger and bigger and more fully developed since I took these photos. 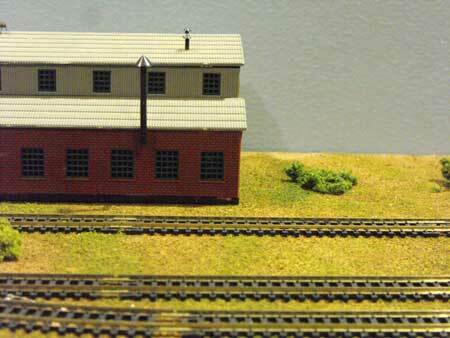 This is a small N-scale modular layout. 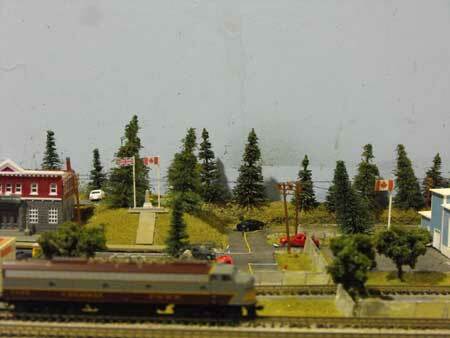 The Muskoka region is an area of famous lakes north of Toronto. 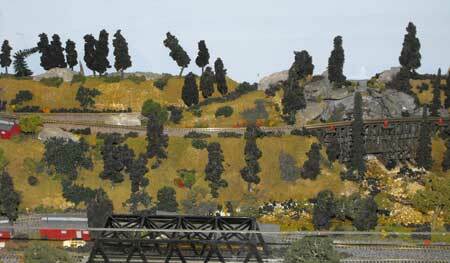 This was a modular HO-scale railroad that was exceptionally well-done with excellent scenery and trackwork. 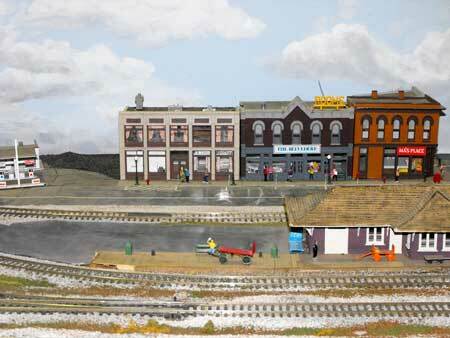 Here's a very small ON30 whimsical railway. 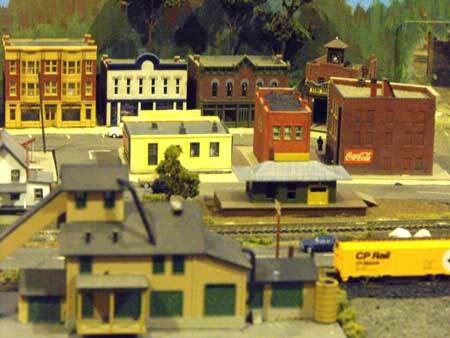 It is only a few feet square. 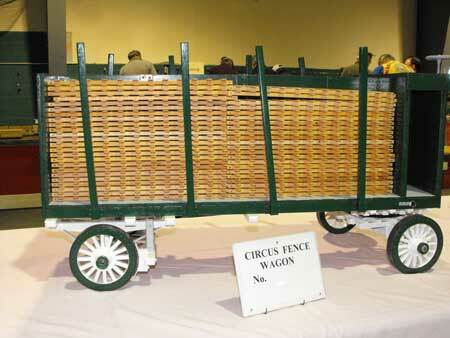 This really shows what ingenuity can do in a very small space. 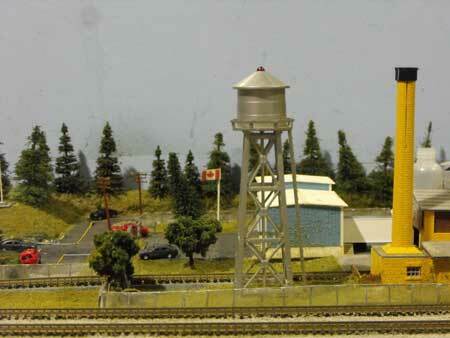 This group is based out of Newmarket, north of Toronto. 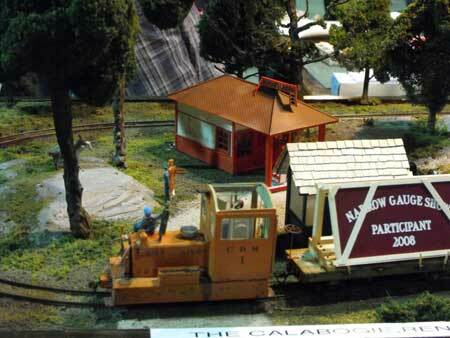 They imported the outdoors for this early october train show, complete with pumpkins. 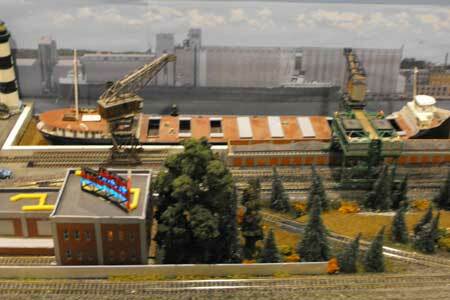 The trains are all G-scale from LGB, U.S. 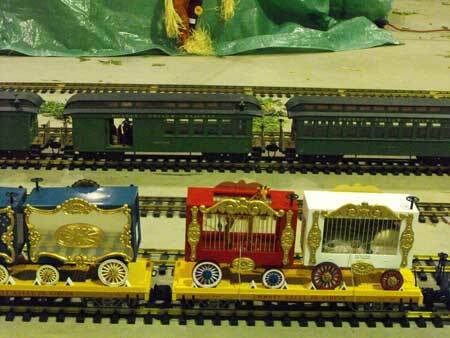 Trains, Aristocraft and other manufacturers. 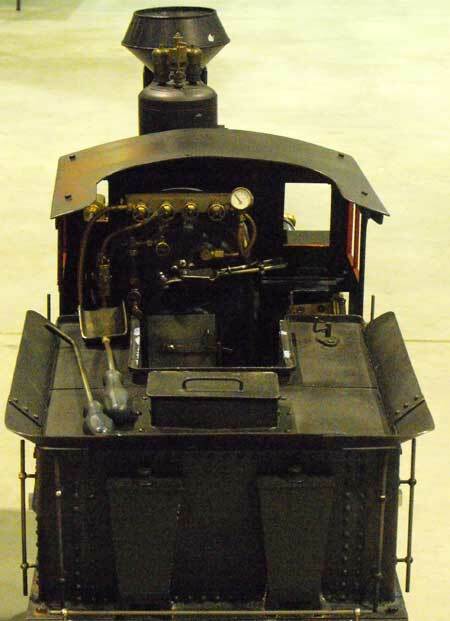 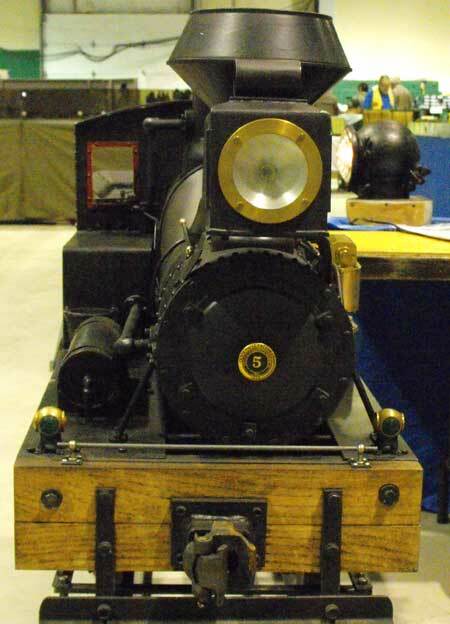 Locomotives were usually painted in Canadian livery. 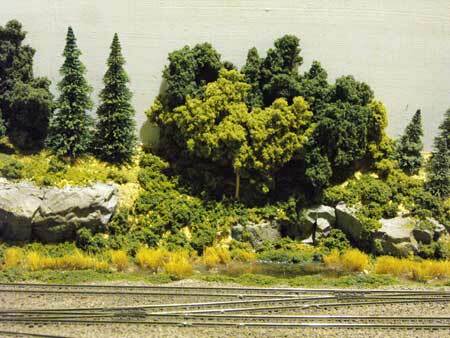 This is an N-scale layout following Ntrak standards. 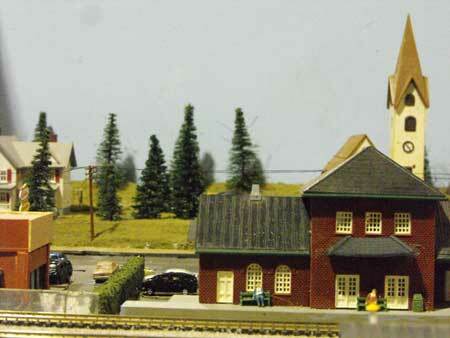 Scarborough is an eastern suburb of Toronto. 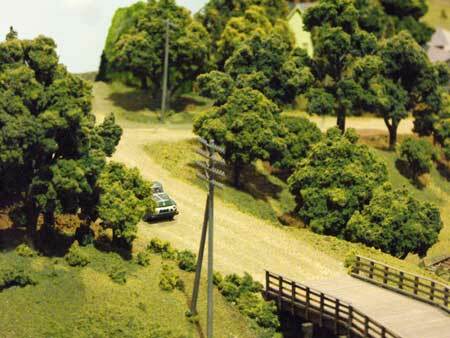 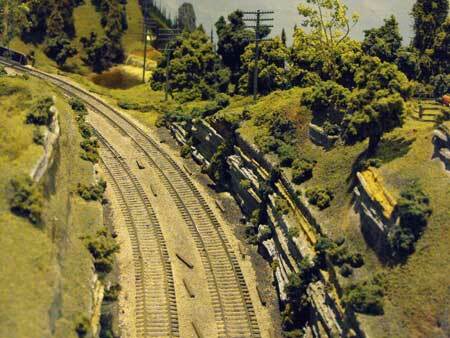 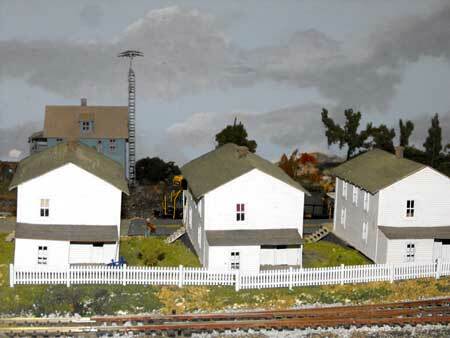 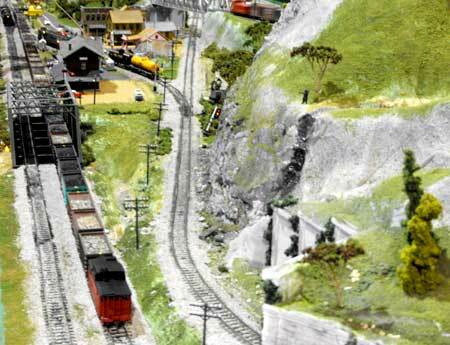 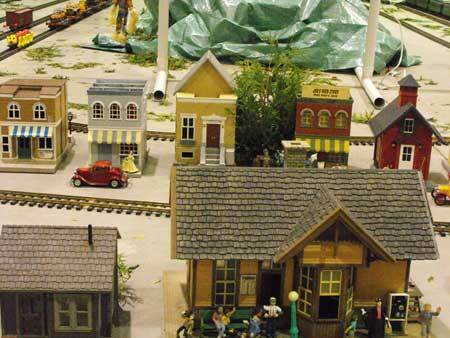 The Scarborough Club hosts open houses in November for its HO-scale and N-scale layouts. 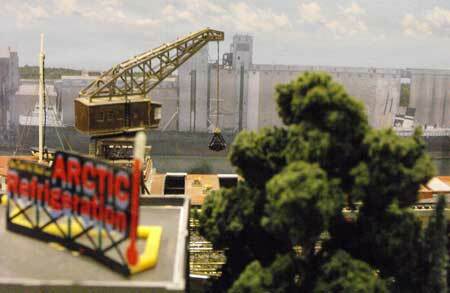 This is the traveling N-Trak roadshow. 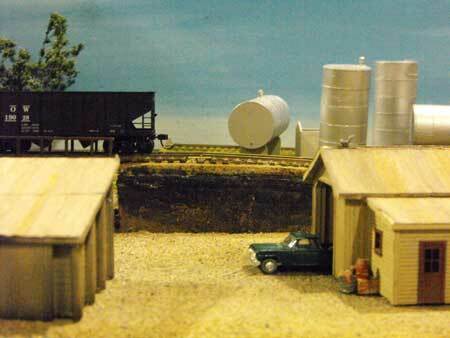 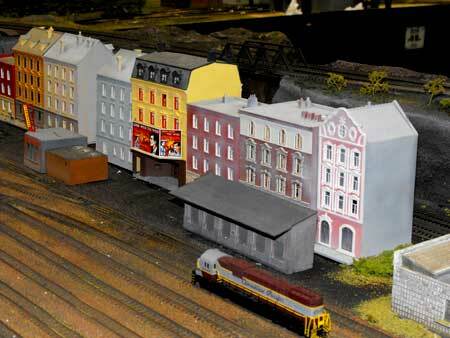 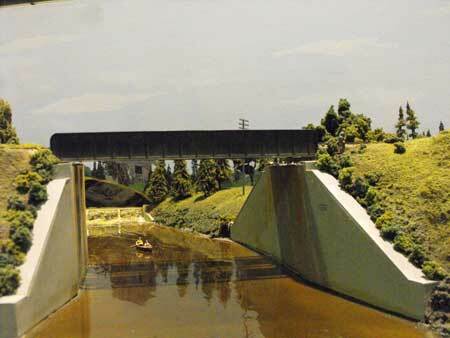 Here's an N-scale layout in the early stages of construction. 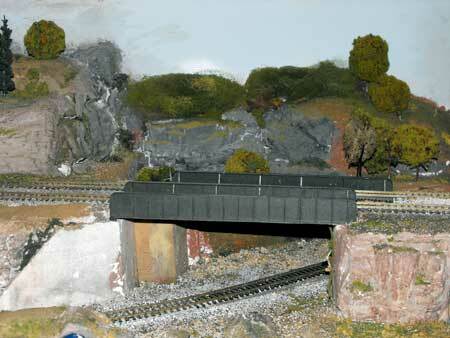 Scenery and structures are being added. 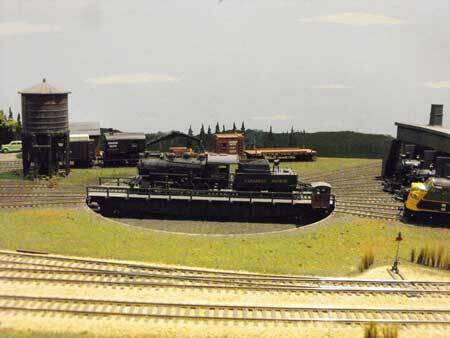 This group has been a fixture in the Toronto area for years. 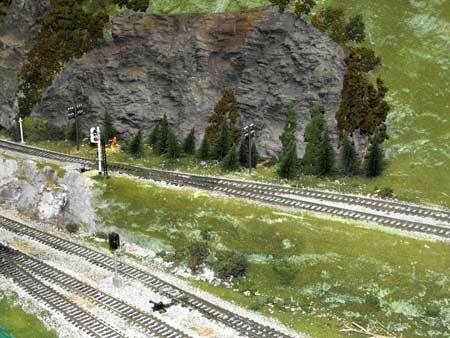 They operate live steam on track in Richmond Hill, north of Toronto. 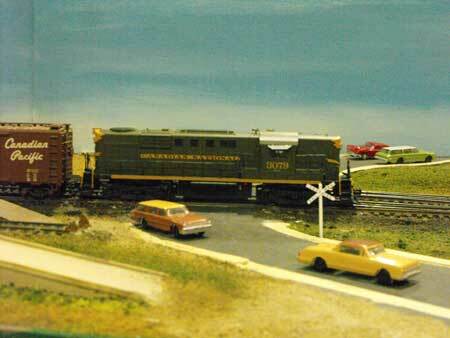 This used to be a great weekend excursion in the summer. 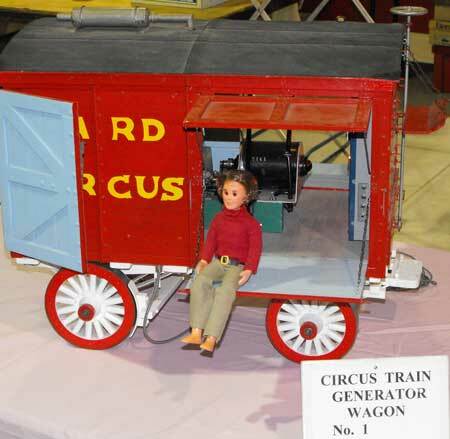 The crowds became so large they had to discontinue their annual public show. 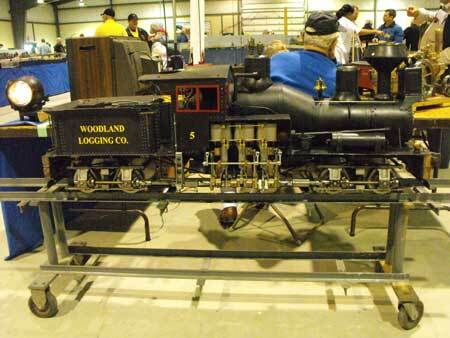 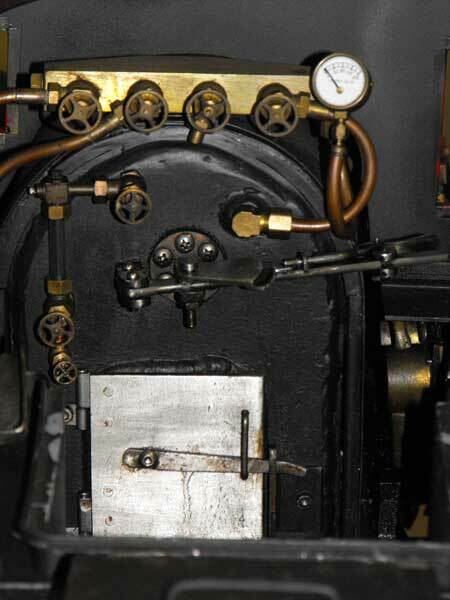 Here are a few views of some of their hand built equipment.